The early Android Q build has a dark theme and it is system wide. XDA Developers picked up the leaked Android Q build with February's security patches and flashed it on a Pixel 3 XL. The results: A video showing the changes in action and a flurry of techie headlines quoting a much-quoted story in XDA Developers about the find. Yes, they managed to get an early look at the build. Call it a leak, call it a sneak peek, but the story is now out showing what might be the upcoming features. Top-quoted find: The system-wide dark mode. Mishaal Rahman filed a report on Wednesday about the Android Q.
Rahman said "there's a lot to digest." They flashed the build on the Pixel 3 XL to explore and call out the changes they found. Of all the aspects explored, "The most significant feature confirmed today is a system-level "Dark Mode" that can be enabled in Display settings," remarked Abner Li on January 16 in 9to5Google. (For many, the reaction to Dark Mode might be "finally." As Chris Burns in SlashGear remarked, "finally, after long last. It's time – or might be time – for Android's Dark Mode." 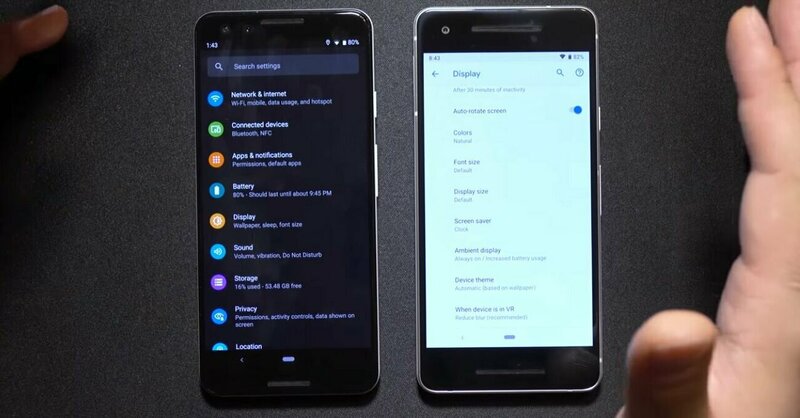 Rahman commented that "This is by far one of the most requested features from users because dark themes are known to save battery life on smartphones with OLED displays, so we're glad to see Google finally implement a built-in dark mode." The dark mode topic is nothing new; in fact talking about it has been heard for some time, accompanied by highs and lows in expectations, and until now, signifying little. Back in February last year, Brittany Rostom said in SlashGear that "Anyone with an Android device can enable a dark mode on their tablet or smartphone, but doing so requires a third-party app. Not interested in using one of those apps? Android itself may soon have an alternative." Anyone with an Android device can enable a dark mode on their tablet or smartphone, but doing so requires a third-party app. Not interested in using one of those apps? Android itself may soon have an alternative. Rahman went on to describe it as "a fully functional system-wide dark mode in Display settings," where you tap on the Set Dark Mode option; the XDA Developers site carried screenshots with the dark theme enabled. Settings, Launcher, Launcher settings, and Files app have a dark gray tinge, while the volume panel, Quick Settings panel and notifications are black, wrote Rahman. Chris Burns in SlashGear simplified what the user gets once opting into Dark Mode; he said it is the "flipping of the switch on an app – in this case, a flipping of the switch in all apps and the desktop and menus, too. It's the switching of dark letters on light background to dark background with light letters. It not only looks good on most displays (since they all project LIGHT), it provides a more optimized environment for battery conservation." We interrupt all this bright chatter, now, to bring you a down to earth message from Jacob Siegal in BGR as he digests the information about the leaked build: "It isn't anything like the Android Q Developer Preview that Google will roll out in March," he said, but "is helpful for confirming which new features and fixes Google plans to implement in the next public version of the Android operating system." Now, wait another minute —or two-for this one, from Tyler Lee in Phandroid. Lee reminded his readers: "Since Android Q will only be released much later in the year, it's hard to say if this feature will make the final cut. Google has been known to test features only to remove them later. While it's nice to see system-wide dark mode in Android Q, maybe temper your expectations as to whether or not it will actually be part of the final public release." Actually, noted Tyler, the dark mode for Android was talked about in the past. "For some reason or the other, the feature has always gotten excluded at the very last minute," he said. In turn, "you can't blame us for being a bit skeptical when we heard that Android Q could finally bring a system-wide dark mode to Android." Brad Linder in Liliputing said that features discovered by those who had got their hands on the early build may come later in the year but "there are no guarantees. Google does have a habit of testing features that don't make it into the final release." Nonetheless, XDA team's added bonus, a video, titled "Android Q—Exclusive Hands-on First Look on the Google Pixel 3," video was published on January 16. You get to see the Q features they discussed.